With some artists, you don't have to listen to their whole catalog to know that they have a knack for songwriting. 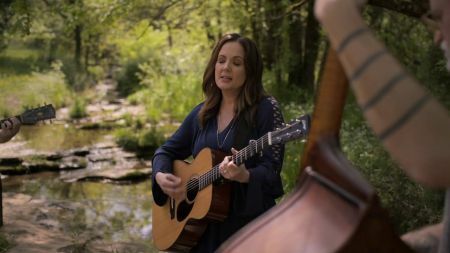 On the new album The Tree, Lori McKenna leaves no doubt that she has that knack. "The Fixer" is one of those intriguing story songs about an ordinary sort of character that is known for fixing things. You can practically imagine the garage when McKenna sings that he has bicycle tires and lawnmower parts. There is a twist to this song though. Without explicitly stating it, McKenna paints the picture that the fixer's wife is ill and that her health is the one thing he'd like to fix, but can't. It's an amazing story made even more amazing by this revelation. Some songs hit you like a punch to the gut. "You Won't Even Know I'm Gone" is one of them. The narrator describes going through her daily routine with chores like folding laundry and washing dishes. But the punch to the gut comes when she sings about leaving a note and wondering if her partner will even notice she's gone. This song is reminiscent of Cory Branan with the spare melody (featuring only acoustic guitar) and the evocative delivery of the lyrics. Don't be surprised if you need a deep breath after this one. "Whiskey breath don't faze her anymore." That's how "You Can't Break a Woman" begins. This is an interesting song. Ultimately it is about a woman who is strong enough to not allow herself to be broken anymore. The thrust of the song is that "you can't break a woman who don't love you anymore." At the same time, however, it is utterly heartbreaking. When McKenna sings, "Every time you were stoned, she just got a little more numb," you can't help but feel a lot of the pain the narrator experienced. "Like Patsy Would" is another powerful song. It's a slow-tempo, heartfelt song about being a songwriter. In the chorus McKenna sings, "I want to play it like Jesus is listening...try to sing it like Patsy would." It's easy to imagine this being a popular song with American Idol contestants who are singing their hearts out and trying to win the judges over. This is an album of 11 powerful songs - made more powerful by the simple arrangements. McKenna has a way of singing that makes you feel every word. And she doesn't have to emote excessively to do it. If you're a fan of strong songwriting and good stories, you will love this album. The Tree will available everywhere on July 20.